The venue was packed before the first band ever graced the stage. Tons of kids in line waiting for a band that hadn’t since their fall US tour with Bring Me The Horizon, and Architects UK. While She Sleeps, a metal band from Sheffield, England were up first. The vocalist, Lawrence Taylor mentioned during their set that it was the band’s first time in USA and were loving the reactions from different crowds and cities. They got the crowd off their feet and moshing, which is suprising for an opener. In case you missed this tour, you can catch them on the entire Vans Warped Tour this summer. Veil of Maya put on a perfect show, in every sense of the word. Marc Okubo's guitar playing was phenomenal, Danny Hauser was slappin’ da bass like a boss, Sam Applebaum hit the drums like Chris Brown hit Rihanna and Brandon Butler screamed his way through a mix of old and new hits. Opening with the instrumental, “Pillars” from their second album, “The Common Man’s Collapse" and transitioned in to another song from that album, "We Bow In Its Aura". The rest of their set included a few of my favorites such as "Unbreakable", "Crawl Back", "It’s Not Safe to Swim Today", and fan favorite, "Punisher"
The Word Alive came on stage next and frontman Telle Smith commanded the crowd with “2012”, a song from their 2010 debut, “Deceiver”. Their set included a majority of songs from their latest record, “Life Cycles”. He didn’t do his signature back flip but they still put on an amazing show. After what seem liked forever, it was Parkway Drive's turn to play. The crowd was already push-moshing before the band came on while “Sparks”, the intro track to their newest record, “Atlas” played over the PA. “Old Ghost/New Regrets” was up next on the setlist. Winston McCall, the ferocious vocalist, noted he had been coughing up blood the last few days but the band sounded better than the last two times I had seen them. During the end of the set, Winston asked the crowd if they'd rather hear a new song, “Swing” or an old song, “Romance Is Dead”. The crowd opted for the latter and erupted in the pit when guitarists Luke and Jeff played the opening riffs. 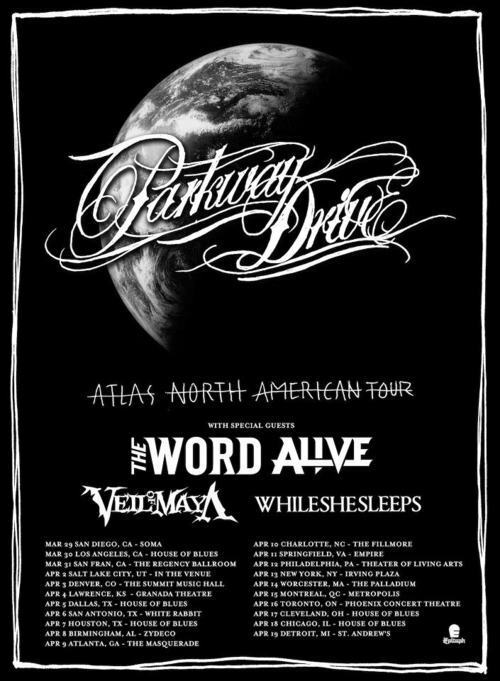 Winston also added it had been two years since Parkway Drive had made it from down under for a North American tour. Tons of crowd surfing, stage dives (when the security guards weren’t looking), and sing-a longs made the night unforgettable. Don’t miss the rest of this tour!